Korean K-pop band 'BTS' are seen at 'Jimmy Kimmel Live' on November 15, 2017 in Los Angeles, California. 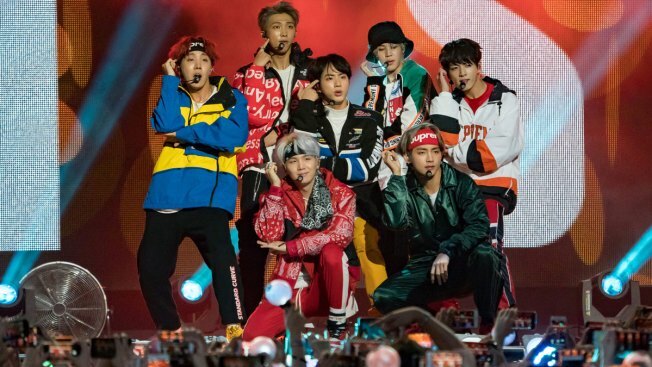 The global sensation BTS is set to perform the world television premiere of their new single at the 2018 Billboard Music Awards Sunday. The Korean pop band is on fire these days. Not only are they the reigning Top Social Artist winners, but they also just announced their highly anticipated new album, Love Yourself: Tear. The seven-member group, nominated for Top Social Artist again this year, scored their first Top Ten album on the Billboard 200 chart in October with Love Yourself: Her and their first top 40 hit on the Billboard Hot 100 with "Mic Drop." With Kelly Clarkson taking over hosting duties, and Camila Cabello and Shawn Mendes set to perform, the boy band adds even more star power to the annual award ceremony! While the K-Pop group is no stranger to show-stopping performances, they still get nervous in front of huge crowds and can't believe when fans are screaming for them. "It is like something that we can never get used to," BTS member RM told E! News in November. "It is new every day." The BBMAs were the first American award show that BTS ever attended, making their performance on this year's stage even more special. "I mean, it's crazy. This is the first time we've come to like an American award show and it's also Billboard," BTS shared with E! News at the 2017 Billboard Music Awards. "The name is really huge for us. We've been listening to Billboard since we were like eight." The 2018 Billboard Music Awards will be broadcast live from the MGM Grand in Las Vegas on Sunday, May 20, at 8 p.m. ET by NBC. Tickets to attend the annual event are on sale now.